Coming to Japan was definitely a culutural experience. A way to see how differently people live outside the US. I have learned it’s definitely different. I don’t even know were to start, portion size, recyling, no litter and even the amount of trash. The portion sizes are much smaller. Although, I think they are more of the size portions should be. Just because in America we want a full plate and want to be extremely full does not mean that’s correct. I feel like Japanese eat to live, whereas Americans live to eat. Majoriy of the places we visted, recycled. It wasn’t hard at all, there were just different bins for different items, all next to the trash cans. There was no litter on the street, despite the scarcity of trash cans around the city of Tokyo. I think it’s absolutely great, that a place that resembles New York can be so clean. The amount of people and the city atomosphere does not affect them. They hold on to the trash until a trash can is found. Oh wow! What an experience. The Onsen experience, my cousin who lived in Tokyo for a year told my friends and I to make sure we tried an Onsen. He failed to mention, that they were expensive and that you were completely naked in the process. An onsen is a jacuzzi like bath, used for relaxation. The spa Vida and I went to, had a sauna and an option for massages, it was in Roppongi. Of course, like Americans we attempted to wear swimsuits in the bath. A nice lady (who I made add was naked herself) explained to us that it was inappropriate to wear suits around the facility. It is a tranquil place used for relaxation and everyone should be free. Almost fell asleep then. They also had, the best massage chairs ever! The best 300 yen I had ever spent. I am not sure if they have them in the Lansing area or not, but it would definitely be a place I would go for relaxation and a nap after class or work. I think it is absolutely amazing that there is a MSU alumni association of Japan. I think it is even more amazing that they take the time and money to mingle and meet the current students at MSU. I know that MSU has students from all over the world and their students get jobs/careers all over, but I never thought that i would be enought people to have their own chapter. The MSU alumni were very nice and I could tell that they wanted to interact with us and see how the society of MSU has changed. I wanted to use the luncheon as an opportunity to network with the alumni and find out how they were able to find postions outside of the US. Many of the individuals i spoke with were communications, advertising or something of the other. Japan is so well known for their technology and marketing, that it makes sense that those degrees would be well used. I also wanted to know if MSU was as renowned around the world. Cars in Japan are so much nicer then cars in America. I have seen so many nice cars, from the oldest Toyota to the newest Bentley. No matter what the car is, it is kept up. There are no dings, scratches or dents. I have only seen 1 car wash my entire trip but I yet to see a filthy car, or better yet, a dirty one. Toyotas appealed to me because I own a Toyota and I know they come from Japan. Although, I did not see any of the Americanized Toyotas we have. No corollas, camrys, sequoias. I actually feel like I saw no SUVs the entire trip. I saw a few vans, but they were used for business use. I never even saw a taxi van for large travel groups. I saw Toyota Crown Royals and Allion mostly. Toyotas that we do not have in the US. I also saw 1 Suzuki, a scion, many Nissan and even more luxury cars. I know Lexus and Scion are both under Toyota so I expected to see plenty of them. In reality, toyota and lexus definitely, scion not too much. Video games are not something I usually do. When I had more time in high school I used to be addicted to computer games. I was a huge fan of The Sims and any Tycoon game. Being in Japan made me remember how much fun gaming could be. There are so many variations and just because I am not a fan of video games, I could still participate in SNS games, mobile gaming or even Internet games. I have an iPhone but I do not have any games on it. Mobile games are an easy way to kill time. Very rarely do people without their phone and it’s always available. People also spend an ample amount of time on SNS sites and games can help connect you with other people who you may or may not know. Internet gaming is pretty much the same except for having to be extremely careful and rarely knowing who you are playing against. We visted numerous gaming companies and they all seemed to run strong because they had a forte. Whether it had been mobile gaming, 3D interaction or video or Internet games. I had never been to a baseball game before. I am usually not a sports person. I have been at MSU for 4 years and have only been to 1 game, a basketball game. Going to the Tokyo dome for the baseball game was amazing. I had no idea what to expect. The only thing I knew was that US baseball games are usually boring but Japan games are more animated. I don’t know for sure or not that US games are boring but this game was definitely animated! Everyone in the stands were wearing Tokyo Giants attire, they had baseball bats, puppets, everything. They never stopped cheering, I couldn’t ask for more. Even the staff was friendly, something not commonly seen in America. You could bring in your own food or beverage, and the staff would put it in an appropriate container. They even gave out pretz with a player on it! Great hospitality! I also had someone to root for, #88 only because I was born in 1988. Japanese children are so independent! I have seen so many children on subways and trains by themselves! These children are not old either I have seen some as young as first grade. Or atleast I think their in the first grade. I could not image seeing young children in America, taking the bus and taking themselves to and from school. I know some children do it, but it is definitely not a majority. I told myself when I first got here, the transportation system can’t be that hard if these children do it by themselves. The other day, I saw a little girl no older than 7 doing her homework on the subway. She had a mobile phone, and it was larger than her face. We did here from Dr. Smith at Waseda that younger children have more worker than the older children. As you get older your workload decreases, the opposite of the US. I am sure that has something to do with the independence of their children. Comparing Osaka and Toyko is very easy in my opinion. Tokyo is very high paced and Osaka in my opinion is a little slower. The hotels are also very different. 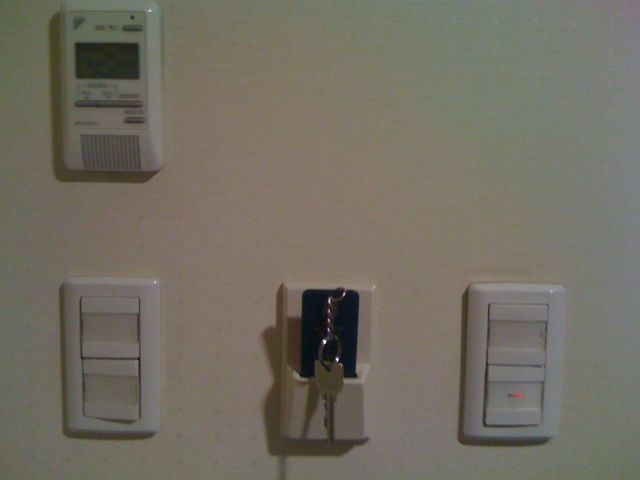 It seems like Osaka hotel is more advanced. They both have automated toilets, with all the special buttons, spray, bidet and water pressure. And regular, actual keys. Their coworkers all spoke English, which makes me think they are high in star rating and their employees get paid more. I also that it was really random that they loaned out umbrellas to their guest. In contrast the Osaka hotel seemed more modern. 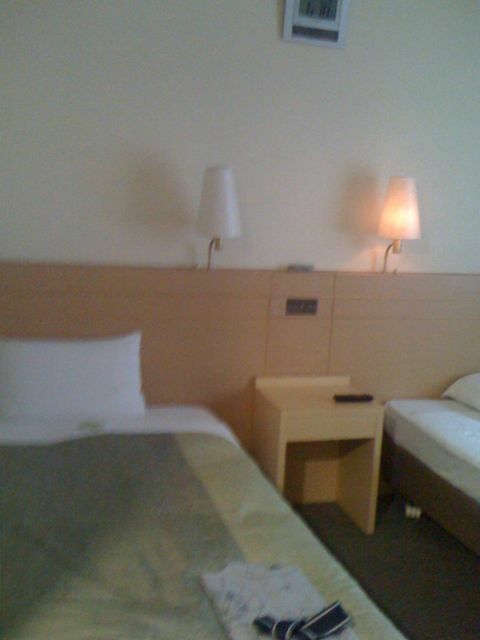 They had flat screen TVs, a work area and really comfortable beds. 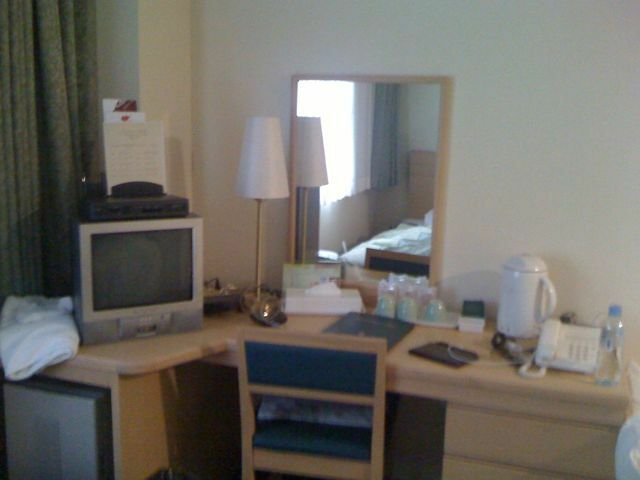 The hotel seemed as if it was moreso for work related business. It was contectes to a cafe, that stayed open late, for late night workers. It may have just been the consitent Internet access but, I enjoyed this hotel more. The Hotel Center of Asia seemed like more of a tourist hotel. They offered breakfast each morning and although it was repetative I enjoyed it! I love miso soup and I was able to have it everyday, along with the great correisants. If I had a choice I would stay at either of these hotels again. When I think of japan, I think of bright lights, electricity, and tall buildings. Traveling to Osaka and then traveling to Hiroshima, I saw a part of Japan I would never thought I would have seen. Deer, mountains, trees, definitely aren’t the things I think of when I think of Japan. Even though I was scared of the Deer, I really really really enjoyed it. Completely scared of animals but it was still interesting. The temples were also great. They had history and were also great for picture taking. The temples contained Buddhas and were sacred and respected, even us unruly Americans were able to respect them while we were there. I even enjoyed Hiroshima, seeing the Atomic Bomb Dome museum. I knew of the incident but I definitely didn’t know all the details. This trip was definitely my favorite day! Today I saw the most outrageous phones!! It wasn’t even at NTT Docomo, it was in Harajuku. There was an entire line of water proof phones, and the demo was a phone in a sink with water running and it still worked!! How amazing is tht?!? Majority of the phones here are flip phones, but they do so much. There are phones that can operate a music player, phones that operate the T.V. and even phones that play music and tv with separate headphones. I even saw a phone that came a part. The ear part and the keypad could separate and when they’re together it works as a touch screen.Oh, and I forgot to mention the 3D phone, yes a 3D phone! It was absolutely amazing. I am although just a little confused. The keyboards on the phones were in English it was a regular keypad with numbers and American characters. How do they use those? Their phones are also much faster in application and Internet speed then ours.